AVS Video Editor, a powerful, full-featured and easy to use software for working with video data! Our software has a number of great opportunities for creating the best possible video and audio, which makes working with video easy and constructive. 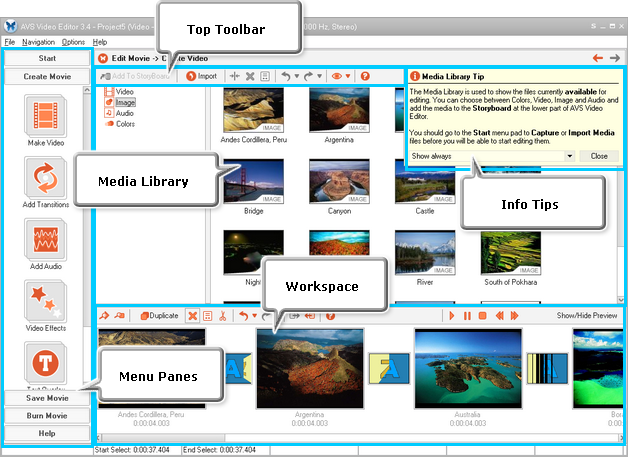 The unique interface is universal for any categories of users as much as possible. Aren’t you interested in imprinting the most remarkable events of your life to video? Workmanship, reliability and exclusive opportunities of AVS Video Editor will help you to get the highest quality of your video recordings. The multi-functional and advanced AVS Video Editor software is necessary to keep the excellent quality of your home video. Feel free to create your own movie masterpieces, burn DVD and share them with your family and friends with the help of AVS Video Editor! You can view your movies on your computer, send them to people in e-mail messages, or post them to a Web server. AVS Video Editor is a powerful, full-featured and easy to use software designed to edit both video andaudio streams of video files. With AVS Video Editor you can capture video from digital cameras or any other video capture device connected to your computer, import video and images to your project, and much more. AVS Video Editor allows you to save the created movie into seven popular video formats: AVI, MPEG,WMV, Quick Time, RM, 3GP and MP4. The software allows you to convert your videos from one format to another in various combinations. Additionally, you can adjust output file’s technical profiles to satisfy your needs. You can customize your files for worry-free transmission via Internet to share your movies with friends, showcase your work online quickly or prepare an outstanding class-project. In AVS Video Editor there is a possibility of recording DVD, SVCD, VCD. You can convert your input files of every supported formats to DVD, SVCD or VCD, create DVD menu and right after that burn it to a CD-R/RW or DVD-R/RW. With the help of this useful option you will be able to play the output disc using any DVD player and watch the created movie on your home TV. AVS Video Editor gives an opportunity to add various transitions to control how your movie sequences between clips. There are about 190 transitions to satisfy any taste. AVS Video Editor has the advantage of various effects to help you achieve your creative best. You do not need to be a professional to use this tool. Once you get started you will be surprised how smoothly you go applying different effects and filters, trimming your files and adding banners and text. You can also preview the results to make sure that you achieved the desired effect. AVS Video Editor has a unique timeline tool, which allows you to achieve accuracy and precision in applying effects and editing your movies. You can use this tool to navigate your video file (frame navigation).